The company has discounted its popular Rs 399 plan as part of its Holiday Hungama offer. The same plan will now come at a price of Rs 299. Reliance Jio has announced an exciting offer for all its prepaid users. The company has discounted its popular Rs 399 plan as part of its Holiday Hungama offer. The same plan will now come at a price of Rs 299. The Rs 399 plan is Jio's highest selling plan and the discount of Rs 100 on the plan will be valid for 15 days. The plan is effective as of June 1 and customers can avail the discount till June 15, 2018. This discount of Rs 100 is only available if the buyer is willing to pay via their PhonePe wallet. The discount of Rs 100 has two components. Customers can claim an instant discount of Rs 50 by performing a normal recharge and then get cashback vouchers of Rs 50. They can do this by recharging through PhonePe, inside the MyJio app. 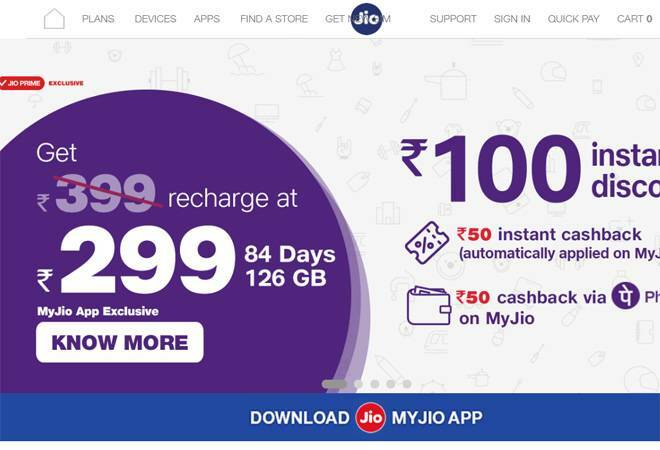 In order to claim the exciting holiday offer, all that the Jio subscribers need to do is first login log in to their MyJio app and tap on the recharge tab. Then tap on the 'buy' button after which the app will take them to the payment page and then they can notice the pre-applied Rs 50 instant discount. Then, while making the rest of the payment, the user will have to use the PhonePe wallet and they will need to log in to their PhonePe account. After that they will have to confirm their number and OTP and make the payment. Users will notice a cashback of Rs 50 added to your PhonePe account and hence get a total cashback of Rs 100 on Rs 399 recharge. With this plan, Jio offers unlimited voice calls, 100 SMS per day and 1.5GB data per day which makes the total data 126GB with a validity period of 84 days. The unlimited data enables one to continue even after the data limit has been reached, but at a reduced speed of 64kbps. Since the plan is valid for 84 days, in essence, one will pay Rs 100 per month to access unlimited data. New postpaid plans have also been launched by Jio grouped with international calling at a minimum of 50p per minute and international roaming facility, a service called 'Zero-touch service experience'. The plan comes at Rs 199 per month and offers 25GB high-speed data. It also provides free voice calls, 100 SMS per day along with a premium subscription to Jio Apps for one billing cycle. Once a user has exhausted 25GB, he/she will be charged Rs 20 per GB.